Bow sight or also called bow scopes are essential accessories that make all compound bows complete. Unleashing the maximum potential of a compound bow makes the hunter perform at his maximum efficiency. Bow sights, in particular, are tools that can’t be ignored because they help you sight at those targets several yards away. For this article, we will feature bow sights by Field Logic. We will present IQ bow sight reviews to help you pick out the best bow sight for your bow. Bow sight is typically mounted at the compound bow’s riser and comparing it with guns; it is like a rifle scope. The bow sight shows you the pinpointed position in which the archer should hit. A bow sight greatly improves your accuracy from close range to even longer distances. Field Logic’s IQ bow sight is an example of fixed pin sight. To make you better understand the advantages of this fixed pin sight, let us learn what they are. Fixed pin sights are the most common bow sights for archers mainly due to their advantages and their availability. Most fixed pin sights range from three to five pins, but there are others that reach up to seven. The top pin is for short distances while the bottom pin is for the farthest distances. These pins have the function of recording the fixed distances with the increments of 5-10 yards for each pin. Setting up the distances require trial and error at first. But when you are finished with that tedious task, the wonders of shooting the arrows accurately is to be reckoned with. The pins stay fixed until you have the need of readjusting them again. Fixed pin sights are known for their accuracy. They can compensate for any changes in an arrow’s trajectory. Field Logic is a company that manufactures various sporting goods, but they are more focused with archery gear. This is one of the most expensive in the IQ series. There’s only one model under this category. Describing this bow sight, it has two fixed pins and one moveable pins for a total of three pins. You can also adjust the zero stop for the moveable pin. There’s also an adjustment setting for windage and elevation. If you want to magnify the scope and see in low light conditions, you can do so with this bow sight. One more thing, this one has two sight tapes. One for the hunter’s perspective and the other from the side. Bow sights under this product can be 3-pin or 5-pin sights with 0.019 fiber optic pins. Any bow sight under this is considered the lightest among other products because of the lightweight fiber polymer construction. The most improved Retina Lock Technology is installed in this product that makes the shooter perform better. Ultra Lite can increase your shooting range by 20 yards or even greater than that. The silent coat finish and stack tight pins improve the quality of this bow sight. This is the cheapest among the bunch of IQ Bow Sights. Variations of this product start from 5 pins to 7 pins. It is said that this product is for more experienced bow hunters. As for the features, it has a Retina Lock Technology that is 50% smaller. This means that the sensitivity is improved twice and can dramatically increase your accuracy. Aside from the Retina Lock Technology, Pro bow sight has a built-in sight level, so you know the angle you are making with the bow. The bow sight also has an adjustable 2nd axis. You can also quickly adjust the elevation and windage according to your desired positions. Should you want to install rheostat sight light to see in low light better, it is sold separately from this bow sight. 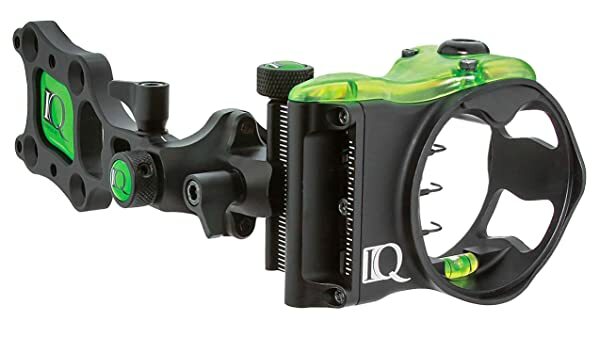 This bow sight can come as either 5-pin or 7-pin IQ bow sights. 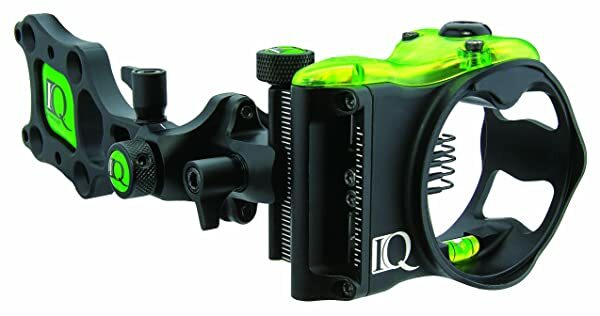 Again, like other IQ bow sight products, this one also has 50% smaller Retina Lock Technology that can identify the slightest torque or anchor point change. Thus, your accuracy with the compound bow is greatly increased. Then, it also has adjustment knobs to change the elevation and windage according to your desired settings. Like Pro, this one also has an adjustable 2nd axis and all other features. But the obvious difference between the two is the 6-inch extension bar for easy sizing of the scope housing for comfort and precise shooting. Under this product, you can choose from 3-pin, 5-pin, or even 7-pin sights. This is the main product line in this article, so the details will be thoroughly discussed later. The retail price of this bow sight for three pin can go higher depending on the number of pins. In this topic, we will main discuss about Micro IQ Bow Sight. There’s always an argument among the archers on how many pins are needed to shoot better. We will list the pros and cons for each 3-pin, 5-pin, and 7-pin bow sights. This bow sight is not too many but not too small when it comes to pins; it’s in the middle. This works perfectly for archers who like to tone down the yardage a bit and when they don’t want to exceed 60 yards. Surprisingly, this 5-pin bow sight had more buyers than the 3-pin and 7-pin variations. The 5-pin bow sight is the middle ground on simple and advanced, and also of the easy and confusing shots. Maybe that’s the reason why there a lot of archers who like using this product. Since there are seven pins and you can do increments that ca reach to a maximum setting at 80 yards. This is greatly effective for hunters who want to reach that distance. You don’t need to worry about missing the shot because there’s always the Retina Lock Technology. The seven pins is a great maneuver for the archer because he can shoot at varying lengths because of the seven fixed distances. These all make shooting better and at fast speeds. Also, adjusting the distance between the two fixed distances is easier because their differences are much smaller. Of course, because this bow sight has more pins, it is the most expensive IQ Micro Bow Sight. Other hunters can’t make do with it especially if they are on a tight budget. Also, the downside of having too many pins is confusion for those who are not used to it. This bow sight has a maximum distance setting of about 40 yards. Anything above that and you will need more pins. This bow sight is preferred by archers who want to do practice or those who are more confident in shooting at closer ranges. In short, hunters tend to buy this 3-pin bow sight since they want to keep things simple. The IQ Micro Bow Sight by Field Logic all have the same features and what only differs them are the number of pins. Under this product, you can choose from 3 pins, five pins, and seven pins. Since they have the same characteristics, we will discuss their features first before ranking them. This technology isn’t owned by Micro Bow Sight alone but also other products under Field Logic’s IQ. Retina Lock Technology is a revolutionary technology that is recognized among the archers because you can extend your effective range. There’s perfect alignment for every shot because it can control muscle memory, form, and consistency of an archer to make him shoot at longer distances that were previously impossible. There are a lot of archers that can’t exceed at 40 yards and more confident at shorter ranges. The reason they can’t go more than 40 yards is that they are afraid of bow torque or inconsistent anchor points that lead to misalignment and then missed shots. For example, if there’s a torque of 0.25 inch at 40 yards, the miss will equate to 10 inches. Also, at 20 yards, the torque at 0.25 inch can miss your target at 5 inches. This problem is eliminated with the Retina Lock Technology. 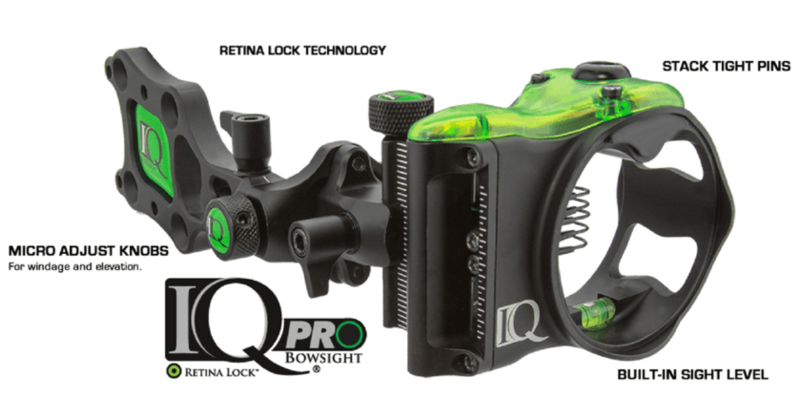 Retina Lock Technology is greatly helpful at shooting longer distances with pinpoint accuracy. Through these knobs, you can perfectly adjust the windage and elevation so you can get to your precise positions before targeting anything. And since these knobs are tool-less, you don’t need any screwdrivers or any other tools to adjust. The pins are made with fiber optic cable either placed behind or around the pin. The longer the cable, the brighter the pin becomes. With it, you can see through your scope in any lighting condition or even in pitch black darkness. The pins are of different colors so remembering the distances is relatively easier. For this bow sight, the sight level is built-in. Sight levels are helpful to know if you’re targeting the prey parallel to the ground or straight ahead. They also make your shots consistent because you’ll immediately know if you’re doing it at another angle. The flexible mount allows you to mount the sight onto the bow’s riser so it can match with your shooting style. Not all IQ bow sights have this feature. The 2nd axis adjustment is about “leveling the level” to make sure that the sight level is functioning properly. If it’s the sight level at the correct position while you hold the compound bow at its natural cant, the 2nd axis adjustment should then be at 0⁰. The 2nd axis is better to be used when doing vertical shots, either from uphill or on a tree stand. As you know, rheostat sight light helps you see better in low light. It is powered by batteries and is sold separately from the bow sight. The Micro Bow Sight can already make you see in dark settings and doesn’t need batteries to power up, but you can always install rheostat sight light should you need more illumination. 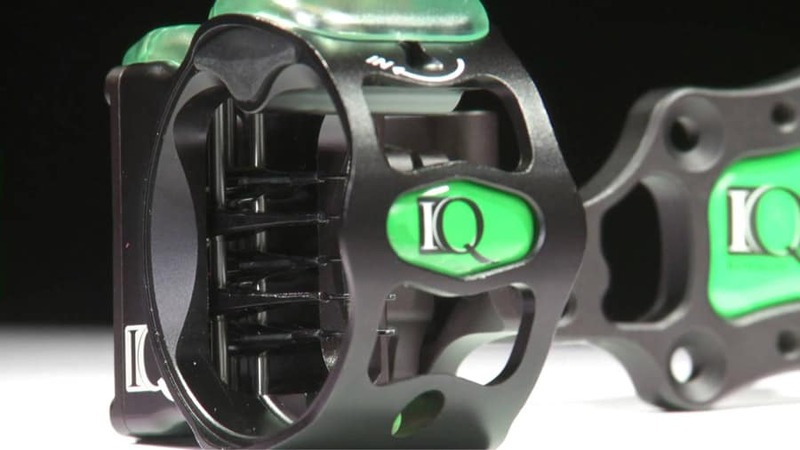 This is the common feature among all of the products in IQ Bow Sight series. There is no bow sight for the ambidextrous, and any bow sight should be purchased for the left-handed and right-handed separately. The left-handed bow sights are priced a little bit higher than the right-handed ones. This concludes the article about IQ Bow Sightof Field Logic. Picking between the number of pins ultimately depends on your shooting style, your preferences, and your budget. This article serves as a guide on what kind of IQ bow sight you should have the next time you go hunting.